One of the biggest outgoings is the food shop, it's a nightmare. It's so easy to over spend, it's hard when you are working to a tight budget. I've been trying to get it manageable for ages, but am slowly getting some where. First I tried to work out, what our basics are, what things I need to buy each week. Once i started to work out the basics, I started meal planning. Now to really save, it takes time, meal planning. Working out a set meal plan for the week and not buying over what you need for those meals. Will save you lots of money, and save on wasted food. Meal planning takes time, but once you get used to it, and work out which meals work for your family, it does get quicker. So the basics, first there is nothing wrong with buying basics, smart price etc. I have big glass jars, so no one would know anyway. We have 3 kids 5 and under, and two come home hungry from school. So I work it out that the children eat a meal at 4.30-5 Monday to Thursday. (They go to bed for 6pm.) On a Friday, we all eat together at 6, when my husband is home, and the children go to bed a little later. This means Friday's meal is a meal which works for all of us like toad in the hole, spaghetti Bolognese or Mac&Butternut. This way, I can plan meals for the children and meals for my husband and I. Most of the meals I make for my husband and I, are batched cooked meals. So I cook double and freeze down for later in the week or the next. This saves time and also money. When you are really struggling or that last week of the month when you have run down pretty much everything, this is the basics. I've always thought, if I have bread and porridge, we will be fed. Making your own bread can be a scary thought but it will save you money and is much better for you. We used to go through loads and it really adds up! Now I bake most days, and I do have a bread maker. But you don't need a bread maker to make yummy bread for your family with ease. Yeast 99p buy the pot not satchels, works out much cheaper. The loose bananas where £1.19, this very very basic shop was under £10. When you are trying to make sure you can stretch your money and feed mini people, it can be hard to think about what meals you can make. Lovely Buns These are mega easy to make, cheap, good for you and great fun to make with the mini people. This should get you through at least 5 days, with yeast, loo roll and maybe potatoes and porridge oats left over. This is a mega basic shop, it's not got all the nutritional and vitamins but if you are really stuck at least you know they will be fed. We stopped eating meat about a year ago now and we have saved a lot on our shopping bill. The children have a multivitamin and am very hot on making sure they are getting everything they need. Since changing our diet we are eating much better, healthier food and cheaper. So don't be scared to try different things. When you are low on money, and you have managed to get a meal together and you child just pushes it away....it can be heartbreaking. So horrible explaining there are no yogurts today. It can easily make meal times very stressful and put added pressure on them and you. So I try and included them. They love making bread with me (youngest tries to eat the flour, middle son loves throwing it about but my eldest is getting really good!) they are much more likely to eat a meal they have helped to make. Basic spices etc to have are - chilli powder, Rosemary, thyme, mint and black pepper. Grow what you can as this will save you money but allow you to make cheap sauces. Make your own pastry. It sounds scary if you haven't before, but you can then make pies, pizzas and things like sausage rolls mega cheap. Use left over veg and a veg stock cube and you have a pie! half and onion and some tomato sauce and a pizza! Short Crust Pastry This is my mega easy pastry recipe, without eggs it brings the cost down even more. Today I had run out of butter so used some oil in its place, was still yummy. You can also wrap a nut roast in this to make it extra special. If you can, shop later. Most shops mark down things around 7pm, and you can get some bargains. Don't throw away stale bread, make your own breadcrumbs! Porridge in your pasta sources, so good for you and thickens up a source. Also adding a teaspoon of marmite will beef up a pasta source. Always go to the reduced sections first when you go shopping. You will be surprised how much you can freeze, from herbs and spinage to onions! Check out your local farm shops, some things can be cheaper as you can buy in a bigger bulk. Look for bootsales, often the regular ones have a vegetable stall. Which is from a local producer, it's often much cheaper. When you go shopping, go to a big shop as many now give free fruit to children while your shopping. This not only makes the shop much easier but it's also a snack you haven't had to pay for. Washing powder, you can spend so much money just on powder! Soap nuts are amazing, they are great for your skin, save you loads and loads and good for our planet! You can use them for assorts of things, from washing your clothes to your hair! Click here for my review on Soap Nuts! Nappies, after trying almost every nappy out there, I like Tesco smart price nappies £1.41! They are fab but 90% of the time I cloth bum! Cloth nappies, am going to do a blog just about them, as well there are so many. They are well worth it and will save you money. Save all your jars, so you can make your own jams and chutneys. I will be sharing some Christmas ideas for old jars soon too. Don't throw away all your peelings! So many plants regrow from peelings! 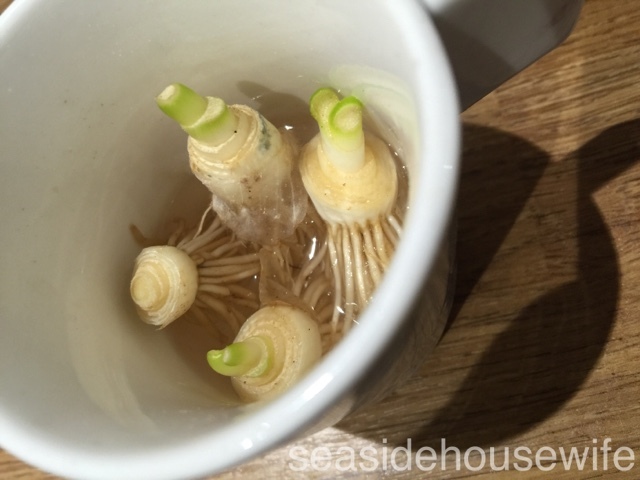 These are spring onions, just chop off the roots, pop them in water and watch them regrow. Once they have found their feet plant them! Same with potatoes peelings, they are fab at braking up hard ground too. I will be sharing soon how I made my veg patch, while your waiting, pop your potato peelings in a brown paper bag in the dark, watch them grow or just throw them on a patch of ground you want to grow beg in or in a big tub. 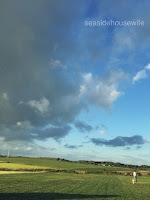 Make sure you check out my Family Budgeting blog too! 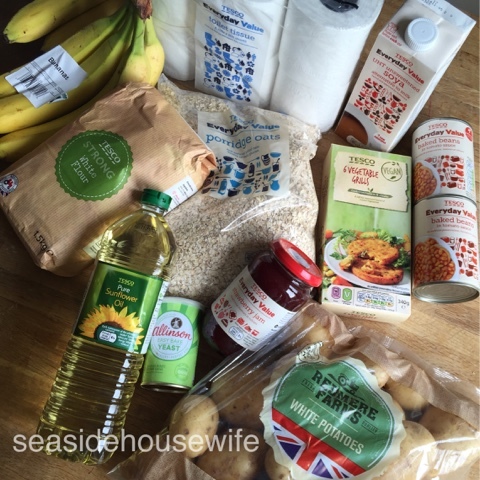 For a family of five, we spend between £60-100 a week on food. If I have meal planned to the letter it's closer to £55-60. Meal planning is the way forward and the best way to save money. Click here for my blog about meal planning. Learning how to make your own bread, Pastry and Pancakes will really bring your spending down. Ok it takes a little longer to make, but before you know it you will be quick. Also the kids love to help, making the batter for pancakes or kneeing the bread. You can make so many meals from one bag of flour (a few other bits and bobs but you get my meaning.) I buy the smart price flour, its fine, its cheap and the pancakes taste just as good.